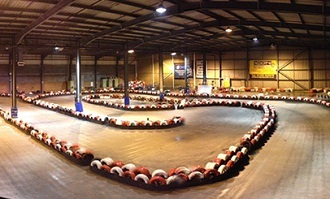 Dundee karting is one of the larger indoor venues in Scotland with an impressive list of events as well as a junior academy that trains youngsters from the age of 8 in the skills required to be a Formula 1 champion. Because the track is a decent size there are plenty of overtaking opportunities and the racing here is always fast and furious. Head northeast on Riverside Drive/A85 then turn left to stay on Riverside Drive/A85 and take the 1st left onto S Marketgait/A991. Go through one roundabout and at the next roundabout, take the first exit onto Lochee Road/A923. Continue to follow A923 for 1.5 miles then at the roundabout, take the first exit onto South Road. Go through two roundabouts and after 1.5 miles at the roundabout, take the second exit onto Myrekirk Road.